I've been in the space business for a while, but I don't think I truly appreciated how much effort goes in to a space mission until I became a (very small) part of the team of people who are developing the eyes for NASA's next Mars rover. The Planetary Society's Bruce Betts and I are participating on the Mastcam-Z team as education and public outreach partners. It is incredibly cool to have an opportunity to witness the development of a new space camera. But long before anybody starts building anything, there is much talking and planning and meeting and talking and emailing and teleconferencing and writing and planning and talking about every minute aspect of the rather small pieces of hardware that will eventually launch to Mars. 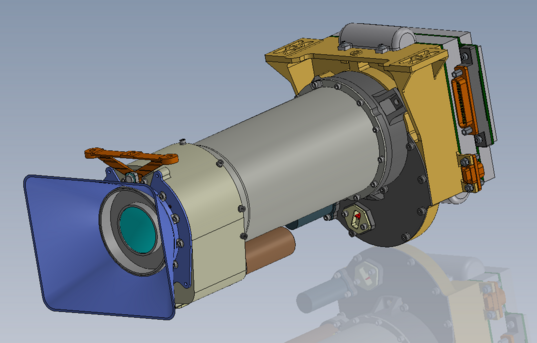 3D CAD model of the Mars 2020 Mastcam-Z color stereo camera system. The Mastcam-Z team is still quite a long way from building flight hardware, but they made a major step closer to that faraway goal this week: they passed their Preliminary Design Review. A Preliminary Design Review, or PDR, is one of several milestones in the development of a spacecraft element. At the PDR, an external board of experts convened to scrutinize the team's plans and identify whether there are any problems that might prevent them from developing an instrument that can be built as planned, on time, on budget, that will function on Mars, and meet its stated goals. The PDR was held on October 28 and 29, 2015 at Malin Space Science Systems in San Diego, who will be building much of the flight hardware for Mastcam-Z. About 50 people were in attendance, including Mastcam-Z team members, associated scientists and engineers, Mars 2020 mission management from the Jet Propulsion Laboratory (JPL), and a board of 11 experts from JPL and outside companies and institutions. I attended and observed the whole two-day meeting. 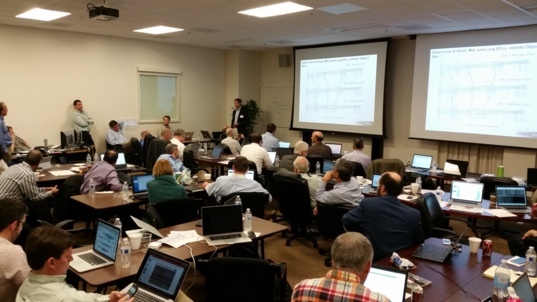 The Mastcam-Z Preliminary Design Review was held at Malin Space Science Systems in San Diego on October 28 and 29, 2015. Approximately 50 people attended, a mix of Mastcam-Z scientists and engineers; Mars 2020 project staff; and review board members and other outside observers. The theme of the Mastcam-Z PDR was "heritage." In spacecraft engineering, heritage refers to designs that are inherited from devices that have previously flown in space. Mastcam-Z is a high-heritage instrument, with several of its component parts being nearly identical to the Curiosity Mastcam instrument design. Heritage is generally thought of as a good thing -- if it's been demonstrated to work in the past, a review board will have much less skepticism about design decisions. However, for Mastcam-Z, heritage is not automatically good. To explain why, I'll have to backtrack to the development of Curiosity Mastcam. The hardware was built by Malin Space Science Systems for the Curiosity mission. The Mastcam-Z instrument for the Mars 2020 rover is based on the Curiosity Mastcam design, with minor modifications. Malin Space Science Systems delivered the fixed-focal-length Mastcams to JPL for integration on the rover in 2009. Then, in 2010, taking advantage of the two-year delay in Curiosity's original launch date, and with key advocacy help from film director and Mastcam team Co-Investigator James Cameron, they were funded to try to quickly develop zoom-capable Mastcams for flight after all. After a Herculean effort, they successfully built a pair of zoom cameras, but the cameras' in-focus performance was not as good as the fixed-focal-length versions already mounted on the rover, and they decided not to make the switch. Curiosity launched to Mars with fixed-focal-length Mastcams. The Curiosity Mastcam zoom cameras remain in storage at Malin Space Science Systems. Mars 2020 Mastcam-Z is taking as much advantage as possible of the heritage of the fixed-focal-length Mastcams that flew to Mars on Curiosity. The camera head (including the CCD detector) will be identical, except for the use of rectangular rather than circular filters on the filter wheel. The camera electronics, mounted in the body of the rover, will be nearly identical, except for an upgraded processor. (The upgraded processor has already flown on planetary missions and is part of the OSIRIS-REx camera.) The calibration target will have a very similar design to past ones, with only minor modifications, some of which The Planetary Society will be helping with (stay tuned for more news on that). The main difference will be in the focus-zoom mechanism that makes up the Mastcam-Z camera barrel. But the zoom development for Curiosity Mastcam ultimately failed to produce images of high-enough quality. How to convince the review board that they can produce a reliable, functional, high-quality zoom camera for Mars? This slide illustrates how much Mastcam-Z inherits from the zoom version of the Curiosity Mastcam. Only the optics require major modifications, because of the switch from fixed-focus to zoom. The entire camera head with its electronics, detector, and electrical interfaces will be identical. The filter wheel will have a slightly different set of filters and the filters will be rectangle-shaped rather than round. The heaters will have minor modifications, and the rover electronics will have slight changes as well. The first step is to figure out what lessons can be learned from the Curiosity zoom camera development. The very tight schedule was one obvious problem; there wasn't time to build and test a prototype before proceeding to the construction of flight hardware. Engineers also pointed a finger at the requirement of a wide zoom range. To achieve the goal of 9:1 zoom, they had to design a compound zoom mechanism with three different moving groups of lenses. That complicated design had to be built very small and to extremely tight tolerances; the slightest misalignment could (and did) make the focus uneven across the camera's images. And the design of the Curiosity zoom did not allow for minute adjustments to be made to the alignment of lenses deep within the mechanism after the whole thing was assembled. There was one problem unrelated to the zoom mechanism: some of the tiny motors that operate the zoom and filter wheel assemblies were found to skip occasionally during testing. 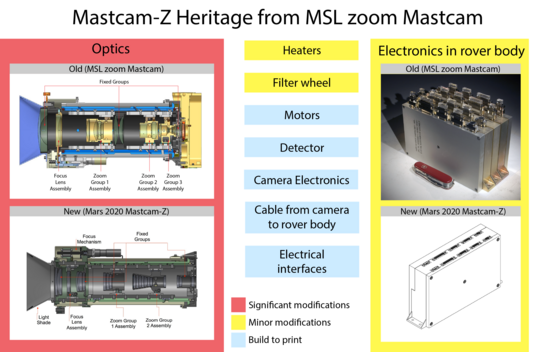 The Mastcam-Z team explained all these things to the review board, and then explained how they planned to avoid the Curiosity zoom camera problems on the Mars 2020 instrument. 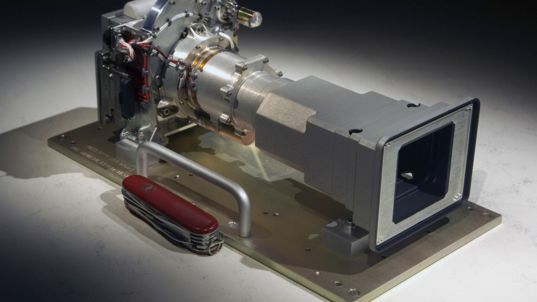 They have arranged the schedule to build an "engineering qualification model," or EQM, of one camera before beginning to develop the flight hardware. They are developing a simplified optomechanical design, with only two moving groups of lenses in the focal mechanism. That will limit their required zoom range to just 3:1 -- matching the endpoints of the two Curiosity Mastcams -- but it dramatically reduces the precision that they must achieve in aligning the lenses to produce in-focus images across the full zoom range. They are also designing the focal mechanism to include compensating lenses that can be adjusted after the focal mechanism is assembled in order to improve camera performance. As for the motors, they're buying extra ones, and buying them early, and will test them thoroughly before approving them for use. It's the review board's job to push hard on the team with questions. They asked many questions about the motors, and many more about the value and timing of building the engineering qualification model (EQM). The way the schedule currently works, the Mastcam-Z team still has to pass their critical design review next fall, and then they will be permitted to begin construction of the EQM. It will take until August 2017 to build it, and then they need to verify that its optics yield high-quality images, and that its zoom and focal mechanisms work as expected. Ideally, they'd also run the EQM through focus, zoom, and filter wheel motions thousands and thousands of times, over Mars-like environmental conditions, to verify the mechanical durability of the camera before signing off on the new design and proceeding to build the two flight units. Unfortunately, there is just not enough time to complete this lifetime testing before they must start construction of the flight units. Thus, they will begin constructing the flight units after verifying the zoom optomechanical design and performance, but before finishing life testing. What happens if the life testing process fails? The Mastcam-Z team has a fallback plan of building fixed-focal length cameras like the ones that have already survived 3+ years on Mars. Nobody wants to have to do that, and the Mastcam-Z team doesn't think they'll have to, but at least they have a plan if the life testing of the EQM fails. One interesting line of questioning concerned whether the camera would still be usable if the zoom mechanism failed in its parked position. They return the zoom mechanism to a stable, parked configuration when the camera is not in use, protecting it against shocks during events such as launch, landing, and driving over rocks. With the current design, this position may not be viable for imaging; it could end up out of any focusable zoom range. This is actually not so different from Curiosity Mastcam; images at any distance are not in focus without some motion of the focal mechanism. Still, some members of the board, nervous about there being both focus and zoom mechanisms that could fail, suggested to the Mastcam-Z team that they at least characterize the performance of the camera with the focal mechanism in its parked position, or consider a design change that would put the parked position in the middle of the zoom range. At the end of the meeting, the members of the board were invited to give individual comments. Overall, they agreed that the Mastcam-Z design was in good shape, especially for this early in the planning process; several board members remarked that aspects of the design were ready for the next major hurdle, the Critical Design Review that will happen in the fall of 2016. I was amused to see that some of the people who had been asking the hardest questions had the highest praise for the instrument! One board member even spun the Curiosity zoom camera challenges as good heritage for the Mastcam-Z team; he said the Curiosity experience could be seen as a kind of engineering model experience for Mastcam-Z. "You found out a deficiency of it, and now you have a chance to build the real one." They were still concerned about motor quality, and the risks associated with it; that the EQM could pass its optical design test but still fail lifetime testing and lead to the descope of zoom capability. They recommended getting the motors in stock and in testing as early as possible, and also recommended an extremely careful look at the lifetime test program to make sure that it is robust enough while not being needlessly brutal. With the PDR in the past, the Mastcam-Z team can continue to refine their designs and plans for hardware, software, parts procurement, development, testing, and calibration programs. In a year, they'll be up for their critical design review, in which they'll have to demonstrate that they have a plan robust enough to actually start building hardware. In the meantime, Mastcam-Z will continue to exist only within the electronics of its designers' computers.